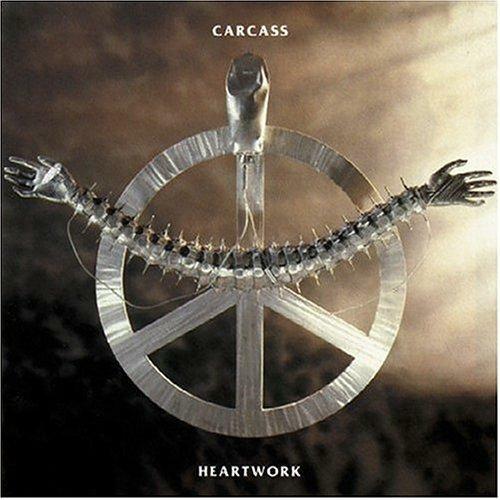 A transitional album that laid some of the foundation stones for melodic death meal, Heartwork was the last Carcass record to feature Michael Amott on guitar. The album is filled with the nucleus of ideas that would grow up into better songs within the Arch Enemy context; Heartwork itself is caught between two worlds, melodic shadings sprouting from a wall of dissonant grindcore sound, and the end result is interesting mostly as an archaeological dig. Almost every track on Heartwork has a few moments of classical-inspired harmonies that Amott would later develop with Arch Enemy. The opening minute of Buried Dreams; the closing minute of No Love Lost; the main theme of Death Certificate. But on Heartwork the overall sound remains that of a band more interested in brutality than artistry, and the more creative moments are rarely cultivated to their potential. Two selections bring the album closest to where melodic death metal would flourish in a few years time: the title track Heartwork is a true discovery of a sub-genre, combining the energy of Carcass with a strong melodic structure that, although limited in ambition, is actually sustained. This Mortal Coil is more monotonous, but also enjoyable for its commitment to both the past and the future: there are undoubted shading of Maidenesque galloping guitars in the main riff, happily wearing a newly pressed death metal jacket. But elsewhere, tracks such as Carnal Forge and Arbeit Macht Fleisch default back to grinding away at a stone that will yield nothing, Carcass holding on, in patches at least, to their grindcore origins of underground metal that snubs anything other than dedication. Heartwork is more interesting for the path it pointed to, better exploited by others, than for the intersection of styles that the album itself occupied. Produced by Colin Richardson. Engineered by Keith Andrews.